Reconnect with what matters when you visit this charming cabin in the heart of Northern Idaho. 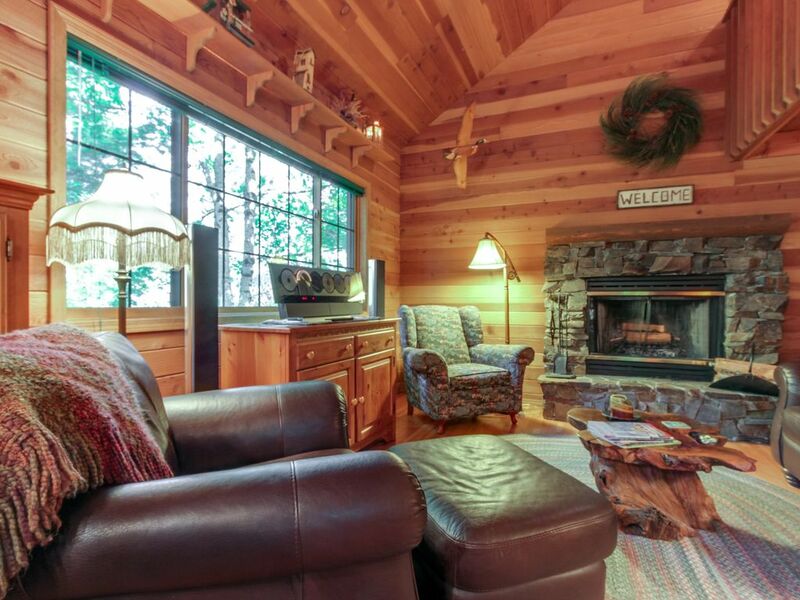 With one bedroom plus a loft, a wood-burning fireplace, and a lovely back deck, this cozy cabin is perfect for one or two traveling couples looking for a simple yet romantic retreat. Perched on the shores of Lake Pend Oreille, this cabin is nine miles east of the nearest town of Sagle and 15 miles from the city of Sandpoint. Captn's Table Restaurant, Odie's Bayside Grocery, and Harbor Marina are within a few minutes' walk. Hiking and fishing can be found very close by in Coeur d'Alene National Forest, and the attractions and thrill rides of Silverwood Theme Park are a quick 32 miles away. The interior of this cabin features rustic and homey touches, perfectly complementing the mountain atmosphere. The well-appointed kitchen features compact appliances and is more than adequate for putting together a romantic dinner. There's also a private washer/dryer, so don't worry about unexpected spills derailing your vacation plans! Spend your evenings relaxing on the deck and drinking in the mountain views - without internet or TV to distract you, you'll have every opportunity to admire the gorgeous natural surroundings, reconnect with your loved ones, and unwind from the stresses of daily life. Regardless of what brings you to Lake Pend Oreille, you won't regret spending your vacation days at this cabin. Book today! *Please note that outdoor fires are not allowed at this home due to local burning bans. Thank you! The Lovelace cabin is fairly secluded, we had no trouble finding the cabin unlike some of the reviewers. There isn’t any cell service, but for us that was the best part. Overall are stay was good but bring your own coffee! We were under the assumption that coffee was kinda like salt and pepper it is always kinda just around. Not the case at this cabin! We had to make a special trip into Sandpoint very early our first morning to get some grounds. This is more of just a warning to the next cabin goers than it is a nock on the property as we thought it must have just been a simple oversight! All things considered it was a good stay and warrants a 5 Star review. We really enjoyed our stay at Vacasa. We were very comfy, although we were not there for much except sleeping and bathing. They suppllied shampoo and soap. Really nice towels, hand towels, and wash cloths. It was really clean, although the freezer to the frig could have been defrosted. And it is quite small. They are well stocked with dishes, and cookware if you are looking for that, but be sure to bring condiments, and coffee, spices, etc., as you will not find those supplied. We wouldn't hesitate to use it again if we ever need to. It was very clean, and comfy. Really nice size for the 4 in our party. The bath towels were super soft! The living room furniture was very comfortable. Would stay again if we ever need to. The cabin is very nice. Lovely. The only change I would suggest is putting shades on the loft level, as BARKING DOGS for several hours non-stop during the night will have you taking a nap during the day...and no shades to pull. I suppose if the neighbors would control their dogs, you wouldn't need to sleep during daytime hours, but as it was, we barely got 3-4 hours of sleep per night. Miserable! It's really too bad; the property and cabin were just fine, but we would NOT stay there again! We were beyond exhausted when we left...got up while the dogs were still barking at first light, and we were out of there by 7am. This was NOT a quiet stay, as the title of the listing suggests. We feel we overpaid immensely and ended up sleep-deprived. We appreciate this guest taking the time to provide us with this feedback! We are sorry to hear about the noises they encountered from the neighbor's dogs. Our local property staff is looking into the situation. Thank you! This is a very nice cabin in the woods but you pretty much off grid. It's a beautiful place to stay and very quiet. It was pretty hard to find and I am hoping they offer the next guests a hand drawn map with directions. You will have no cell service in the area, so navigation by cell is out. Please note you will have no cell coverage, no internet and no TV. They do have a very nice CD player and a landline. I would have given this place 5 stars if it had internet. I was on a business trip and the lack of services was an issue. The nearest cell service is 5 miles away. Satillite internet is available as most of the near by neighbors have it and I would encourage the cabin's owner add it. The cabin was absolutely precious. Had everything you could possibly need for a relaxing vacation. There was zero cell service, so be sure to plan for how to get there without use of a GPS, but they have a land line in the cabin to stay connected to the world. Fairly secluded with only a couple neighbors close by for privacy but still close to a beach and only a short drive to Sandpointe for shopping, restaurants, etc. The cabin was very clean and nicely decorated. I would highly recommend this cabin to anyone who is looking for a quiet getaway!